1 lg. lobe natural veal sweetbreads, approximately 1 lb. Rinse sweetbreads in cold water. Place in a container with the milk and ice and reserve chilled for 12 hours. This is necessary in order to clean the sweetbreads of any impurities. Once soaked, rinse thoroughly in cold water and reserve chilled. Place the verjus and water in a saucepot and bring to a simmer; add the onion, carrot, celery, garlic, peppercorns; and simmer for 15 minutes. Turn the heat off; add the thyme sprigs, lemon juice and lemon zest. Season the poaching liquid with salt so that it tastes like seawater. Submerge the sweetbreads in the hot liquid, and let the pot sit over a pilot for 10 minutes. Transfer all contents of the pot to a bowl and reserve in the refrigerator overnight. Cover with plastic wrap once chilled. At this point, the sweetbreads are poached, but are still very rare. The next morning remove sweetbreads from the liquid. Peel the outside film from sweetbreads, being careful not to pick at every little membrane, or you will be left with only small nuggets. Pat sweetbreads dry with a kitchen towel. Place two very absorbent cloths on a sheet pan and place sweetbreads on top. Cover with two cloths, and then place a sheet pan over top. Place this setup in your refrigerator and weight it down with approximately 5lbs., cans work great. After 6 to 8 hours, the sweetbreads should be nicely pressed. Place chicories in large mixing bowl with the soft herbs and set aside. Sauté the pancetta lardoons on medium heat until lightly rendered with a golden brown color. Set aside in their rendered fat. Place 2 gallons of water in a large pot and hold at a very low simmer, so that you are ready to poach the eggs. Slice the sweetbread lobe into 6 equal portions, pat the sweetbreads dry and liberally season with salt and white pepper. Place a large sauté pan over high heat for 3 minutes. Coat the bottom of the pan with grapeseed oil, turn the heat to medium-low, and place the sweetbreads in the pan. Allow the sweetbreads to cook until the contact area begins to caramelize, about two minutes. Add 2 oz. of the butter, the bruised garlic, and fresh thyme sprigs to the pan. Baste the sweetbreads with the foaming butter for 90 seconds. Flip the sweetbreads over so that the sautéed side is now facing up. Continue basting for 90 seconds. If the butter begins to burn or smoke, adjust the heat lower. Or, if the butter is not browning, then turn the heat up. Press on the sweetbreads to check for doneness; they should not feel mushy, or overly firm; desired internal temperature is 115 degrees. Once cooked, place the sweetbreads on a tray, and reserve, while leaving the brown butter, thyme sprigs, and garlic in the pan for the pan sauce. In the same pan turn the heat to low and add the shallots, pancetta lardoons, pancetta fat, and vigorously whisk in the lemon juice, lemon zest, Banyuls vinegar and chicken stock. Bring the pan sauce to a simmer; reduce for 90 seconds, or until the sauce is slightly viscous; turn off the heat (discard the thyme and garlic cloves). Allow the pan sauce to cool to 130 degrees, then swirl in 2 ozs. of cold butter, and 1 Tablespoon of Dijon mustard to emulsify, and immediately pour over the chicories. Toss the chicories and season to taste with salt. Place the chicories covered in warm environment while you poach the eggs (above the stovetop or in a very low oven). Turn off the egg-poaching water and delicately crack 6 eggs into the water so that they each have a little room of their own. Let stand in the poaching liquid for 4-6 minutes, or until the white is cooked and the yolk is skinning over but still soft in the center. Divide the warm chicory salad equally into 6 salad bowls, leaving a small well in the center of the greens. Drizzle any remaining vinaigrette around the borders of each bowl. Delicately scoop out the poached eggs with a slotted spoon or spatula and nestle the soft egg into the well. Garnish the egg with a sprinkle of fleur de sel (sel gris, or maldon sea salt are fine substitutes), and coarsely ground black pepper. 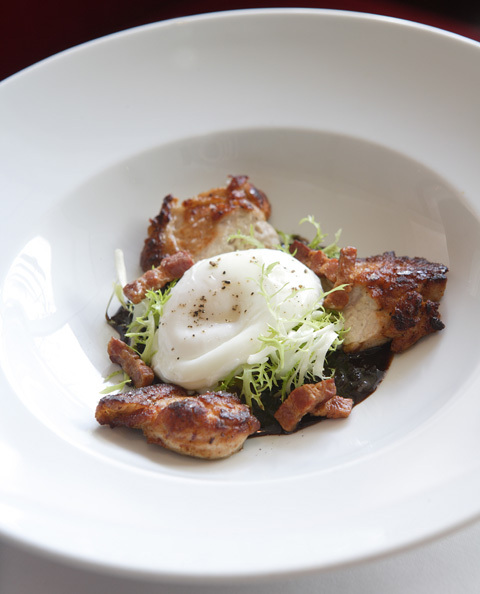 Slice each of the sweetbread pieces in half and place over the salad bordering the egg.